Duration: Yearlong course offered in fall/spring (34 weeks). Suggested High School Credit Value: 1 credit. Suggested Grade Level: 11th grade level and up. Tuition: Early registration tuition (ends 6/19): $475 $525 for HSLDA Members/$525 $575 for non-members. Description: Latin 3 builds upon previous introduction to the Latin language (years 1-2 of Latin). Students will continue to develop their translating and compositional abilities in Latin, primarily through the reading of primary texts. Watch a short introduction from Course Developer Dr. Douglas Favelo. What topics will I learn about in Latin 3? In Latin 3, students will build on the intermediate Latin skills that they developed in Latin 2. Students will continue their introduction to the Latin language as well as the historical context of Ancient Rome. Students will improve their ability to translate, read, and compose Latin. How much homework is in Latin 3? What books will I use in Latin 3? The official booklist for Latin 3 is now available. In the official booklist, you will find information about the editions, book descriptions, and ISBN numbers. Am I ready to take Latin 3? Students taking Latin 3 should have completed Latin 2 or an equivalent course. Students should be able to read and write at a 11th grade level. What if I have a schedule conflict with listed Latin 3 class times? What is the tuition for Latin 3? 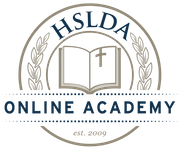 HSLDA members save $50 on yearlong high school courses!